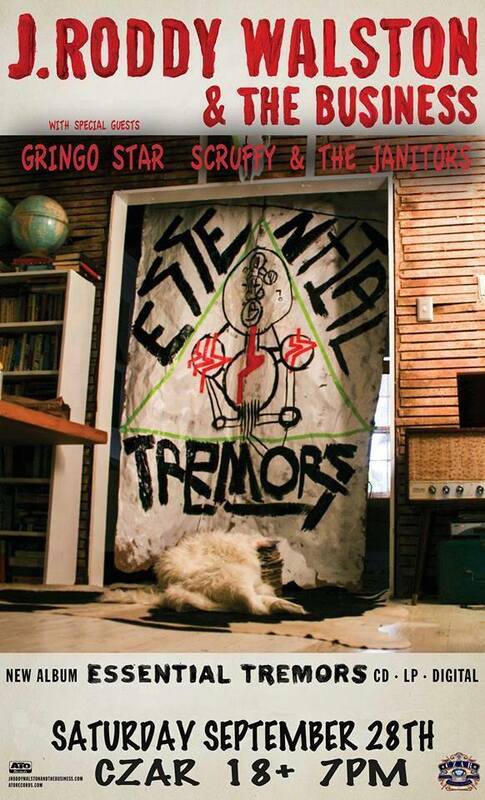 J. Roddy Woloston with Gringo Star and Scruffy & The Janitors poster. Scruffy & The Janitors are hungry for this. Look for them to trot out some of their great new material like “Shake It Off” and “Harry Truman” as well as a few songs from their out-of-print debut album “Pino” like “Post Meridian.” The opportunity to play in front of larger crowds doesn’t come around too often so this band who are all under drinking age will grasp the opportunity to impress in front of a Kansas City crowd. Gringo Star already has an impressive resume, they are a few albums into their career and well seasoned. They have a new record dropping next month and should be eager to promote it and improve their fanbase that is already over 20,000 strong on facebook. This entry was posted in Coming Soon and tagged Coming Soon, concert, Czar Bar, Essential Tremors, Gringo Star, J. Roddy Walston and The Business, Kansas City, Missouri, Pino Floating Out To See, Shake It Off, turning heads. Bookmark the permalink.